If the move of bookmakers off the streets and online was a seismic shift in the way things were done then the invention of In-Play betting was nothing short of game-changing. Suddenly placing bets went from being something that you did before an event got under way, and had to wait until it concluded before you’d know if you were a winner or not, to something that you could do at almost any moment during a match. Not only that but the things that you could bet on because so much more varied. Added to the usual fare of Correct Score or Match Betting were things like Number of Corners, Time of First Throw-In and Bookings. They might well have been available at from some bookmakers before, but they suddenly became mainstream bets that you could place during almost any football match. Here I’ll have a look at which matches are covered In-Play, what happens to the markets during a match and what information you’ll be able to find to help you with your bets, as well as some other things that I think you’ll be interested in. Sticking firmly with my previously established theme of ensuring that we’re all on the same page about what we’re talking about, a quick explanation of what In-Play betting actually is. In short, it’s a bet placed on an event that is already underway. In that sense it differs from both ante-post betting, which is normally done well before the day of the event, and pre-match betting, which is usually done the day of the game but prior to kick-off. There are advantages and disadvantages to each type of bet, with the main one for ante-post betting being that you can usually get decent odds the further away from the start of a match you are. When it comes to In-Play bets you’ll often find that the odds on the main markets, such as Correct Score, aren’t as long as with pre-match bets because bookies will feel as though they have a good idea of which way the match is going to go. Yet what you will get is all of the various markets that I mentioned before. The rule of thumb to remember is that bets placed after the event you’re betting on is underway are, by definition, In-Play bets. When it comes to the games that are covered by In-Play markets, the short answer is ‘practi-cally all of them’. Certainly you’re not going to struggle to be able to place an In-Play bet on the likes of Premier League, Champions League and major international matches. Drop down through the divisions in the English Football League system and you’ll still find most bookmakers offering live betting markets. Things start to get a little bit tricky when you begin to look abroad, but even then any bookie worth their salt will cover the likes of the German Bundesliga, Italian Serie A and Spanish La Liga divisions as a matter of course. After that the depth of coverage depends entirely on the bookie that you use. It’s worth noting that during the time it took me to write that list out, another eight divisions from across the world saw matches get underway. In other words, you’re likely to be hard pushed to find a professional league in world football that you won’t be able to place bets on in the In-Play market, depending on the bookmaker that you want to place your wagers with. As I say, though, there are countless different markets that open up depending on how popu-lar the individual match is that you’re hoping to bet on. Load up your account when Liverpool are playing Manchester United, for example, and you’ll find that the number of bets available for your consideration is about double the amount I’ve just told you about. It’s based on two main things: the likely popularity of the match and the ease for bookies to come up with odds for the various In-Play events taking place. As I’ve hinted at, you’ll also see that there are different markets avail-able on the bookmaker that you bet with, depending entirely on how seriously they take In-Play betting in general. There is usually a delay of a few seconds between the action taking place on the pitch in real-time and the betting market’s ability to respond to any given scenario. For that reason markets can sometimes be suspended in order to stop punters that are, for example, physically watching the match in person from betting big on something that has already occurred. You’ll also find that markets are often suspended over things like penalties, sendings-off or goals. It’s all about bookmakers both protecting themselves and also ensuring that others can’t take advantage of the delay. The delay is something that you need to be aware of across the board, but it’s specifically worth bearing in mind if you tend to place your bets with bookmakers that offer an Exchange. That involves betting against other punters rather than a company, so it’s entirely possible for them to be ahead of you in real time and changing odds on things accordingly. There’s not much you either can or need to do about it, but it’s good to know and perhaps helps to explain why the markets you might be betting on are suspended fairly often. It’s the same reason why the option to Cash Out a bet can be removed seemingly before the result has been confirmed. One of the best ways to give yourself a decent chance of getting large odds on bets is by combining them into an accumulator. I’m not going to go over what an accumulator is here, ex-cept to say that it’s a combination of bets that all need to come home in order for your overall bet to be a winner. The question is, can you place Accas on In-Play bets? The answer to that question, as you might well have predicted, is ‘yes’. The tricky thing in terms of placing accumulator bets In-Play is ensuring that your bets don’t contradict each other. A bet on Both Teams To Score wouldn’t match up with a wager on a Team To Keep A Clean Sheet, for example. 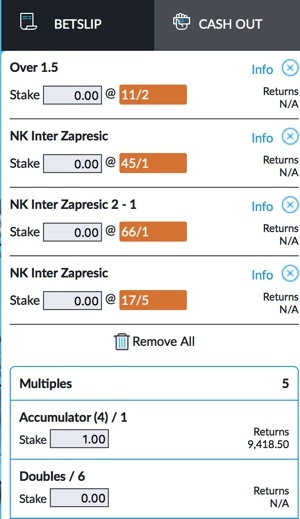 Most bookmakers won’t allow you to place the bet if that’s the case, but make sure you keep your eye on what you’re adding to your betting slip if you want to avoid any confusion or problems. After all, one of the important points when it comes to In-Play betting is the ability to react to the situation taking place in front of you, meaning that speed is of the es-sence. Of course, the reason the odds are so high on accumulator bets is that they’re notoriously difficult to win. If you’re betting on In-Play markets then the likelihood is that things can change in a heartbeat, leaving your Acca in tatters almost before you’ve had the chance to place it. There’s not a lot that you can do about that, obviously, but it’s the kind of thing you’ll want to think about when choosing your selections. It’s also worth looking to see if your bookie of choice offers Acca Insurance for accumulators placed on the live betting platform. That way, if one of your selections takes a nose-dive then you don’t have to throw the entire bet into the bin. I’ve written about Cashing Out in more detail elsewhere on this site, but it’s with a quick men-tion here on account of the fact that the Cash Out option was essentially invented alongside the development of In-Play betting and it becomes even more relevant when you’ve placed an accu-mulator. If you can see one of your In-Play legs going South, such as a Correct Score bet, then you might want to Cash Out whilst you’ve still got the chance of rescuing some money for your-self. This is a dangerous game, though, as the longer you leave your bets riding the more money you’re likely to earn from Cashing Out, but the more likely that it is that your entire bet will become a loser. As I say, I’ve written about it in more detail elsewhere so do check that article out if you’re wondering how to take advantage of one of live betting’s most useful features. One thing that unquestionably goes hand-in-hand with In-Play betting is Live Streaming. The ability to watch a game directly through a bookmaker’s site is a great one to have available to you, given that most bookies tie the two things together and make it nice and easy to place bets as the action unfolds. What I would say is that that delay between when the action is taking place in real time and when bookmakers are reacting to the action is even more prevalent when you start looking at the Live Streaming of games. If you want my advice I would try to limit your bets to the more general markets if you’re betting as you’re Live Streaming. Though it feels like it’s quite common for a team to pull off a shock, more often than not you can get a sense for how a match is going to go after just a few minutes of watching it and the final result is unlikely to differ massively from the overall feel of the game. That’s when In-Play betting comes into its own, when you watch a game and can therefore get a feeling for how the two sets of teams are playing and what result is most likely. If you know your football then you can also get a decent sense for when the game is about to turn, too. All of that is helpful when you Live Stream a game that you’re betting on, but restricting your wagers to the likes of ‘Next Team To Score’ and ‘Correct Score’ is probably sensible. In terms of the actual matches that you can Live Stream, it’s yet another thing that differs de-pending on the bookmaker that you choose to have a flutter with. Some bookies feel that offering plenty of Live Streaming options can attract new customers and so they go hot and heavy over the feature, whilst others tend to believe that other facilities are more important and so aren’t that bothered about how many different matches they have available for Live Streaming. You can usu-ally tell whether a bookmaker values the importance of being able to show live matches by how easy they make it to find the feature on their site. As a rule of thumb, seemingly obscure foreign games are actually the most likely to be Live Streamed, with games that are shown on the big sports channels over here, such as Sky Sports and BT Sport, are unlikely to be available online. One thing that you might want to consider is that the more obscure the event is that you can watch and bet on, the more chance there is of finding some real value. The simple truth of the matter is that not all matches are actively monitored, with many of them being done by computer algorithms. The beauty of football is that it is so often a sport that cannot be explained in any conventional manner. How many times has a team that should be absolutely annihilated managed to get a result out of a match? Just because the Armenian Second Division isn’t particularly well followed in the UK, for example, doesn’t mean that there isn’t plenty of information out there about it if you know where to look. You can busy yourself with loads of research, figure out what bets look like they have the best value and then head to a bookmaker’s website and see what the In-Play market says you can get in terms of odds. If you’re lucky, you might catch a bookmaker unawares. You can see that there’s plenty of information within that to give you an indication of how the match is going, including the fact that it seems to match up well with the actual scoreline. Though the away team is dominating, I’d be keeping an eye on the ‘Shots on Target’ stat given that the home side has only had one and scored from it. Given that there’s only about a third of the match left, I’d be tempted to place a bet on a Correct Score of 2-2. That’s the example from William Hill, but other companies will approach the topic in their own way. Betway, for example, will tell you about how many fouls have been committed, the number of saves each team’s goalkeeper has made and how many injuries there’s been, all of which can be relevant to how a game is panning out. They’ll also give you such information as what the dis-tance is between the two sides. That might not seem all that important when you’re looking at Premier League games, but an international match between a side from Scotland and one from Russia will involve huge amounts of travel that you can take into account when considering whether one team is likely to tire quickly. The final thing I’ll mentioned on the topic is that it’s worth considering outside sources for your information, too. There are countless excellent official sites online that make it their business to collate statistics on major football matches, which is exactly what you want to hear as a bettor. The likes of Opta will tell you about how many Shots on Target a team has, how many Big Chances they create and what their Expected Goals tally is. You can then take that information into your viewing of a live match and see if the team you’ve researched appears to be following their usual path or playing in a different way to normal. The beauty of online betting is that you’ll be online when you’re doing it, with the internet offering a wealth of resources to those willing to put the effort in to find them.